Usually when you think of the Fossil brand, watches or perhaps jewelry come to mind. I am partial to their charms and as proof I have a Fossil charm bracelet which is rapidly growing with enough charms for a second bracelet, maybe third bracelet brimming with their cute enameled creations. (You can see what I started on my charm bracelet here.) While I was perusing the company's website for their latest charm selection and looking for my next acquisition I came across their line of clothing, which also happened to be kind of cute. 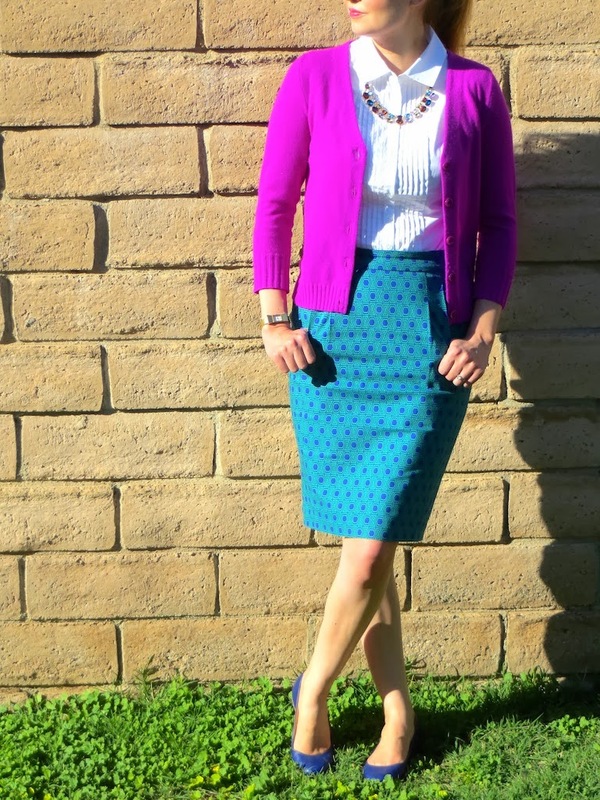 The Hailey skirt caught my eye with its retro 70s vibe. At only $29.99 I had to throw it into my cart and give it a try along with my new batch of charms. 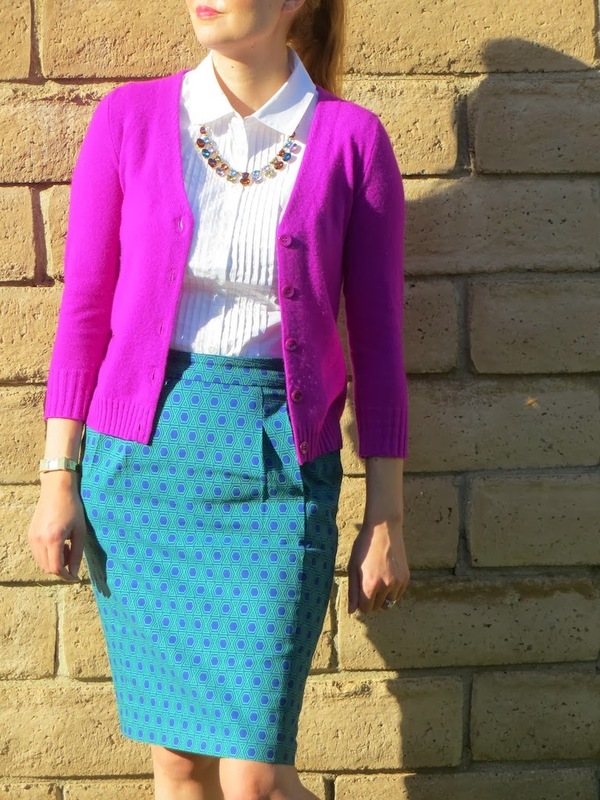 Overall, I was pretty impressed with the quality of the skirt and felt that it made a nice addition to my wardrobe, although I certainly don't need any more pencil skirts! Speaking of adding things to collections that are already overflowing, I also added this necklace reminiscent or should I say "inspired" by the J. Crew Gem Stack Necklace featured this Fall/Winter in their costume jewelry collection. For $7.99 on either Groopdealz or Sassysteals (you can see why I get them confused) I thought it was worth adding to my jewel box. 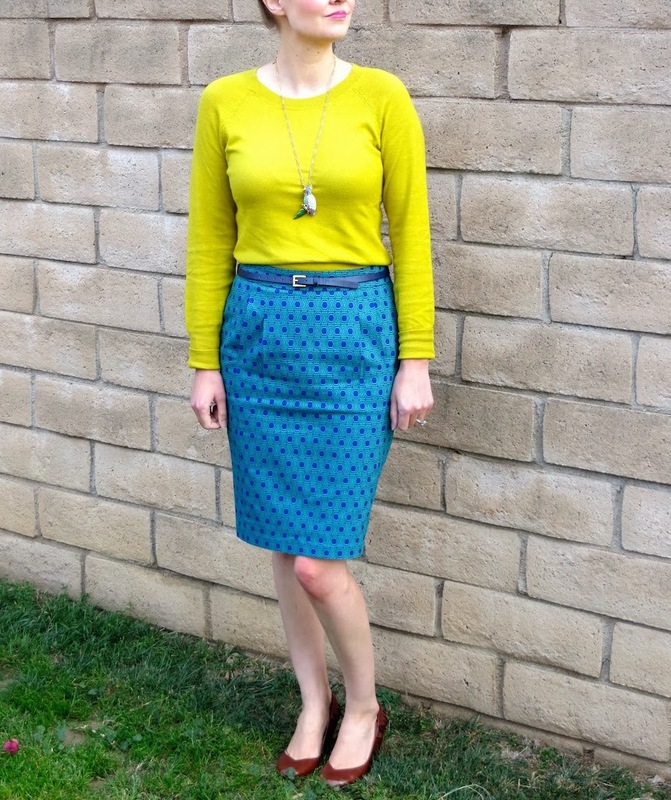 I wore my Fossil Hailey skirt once before, but styled it slightly differently. 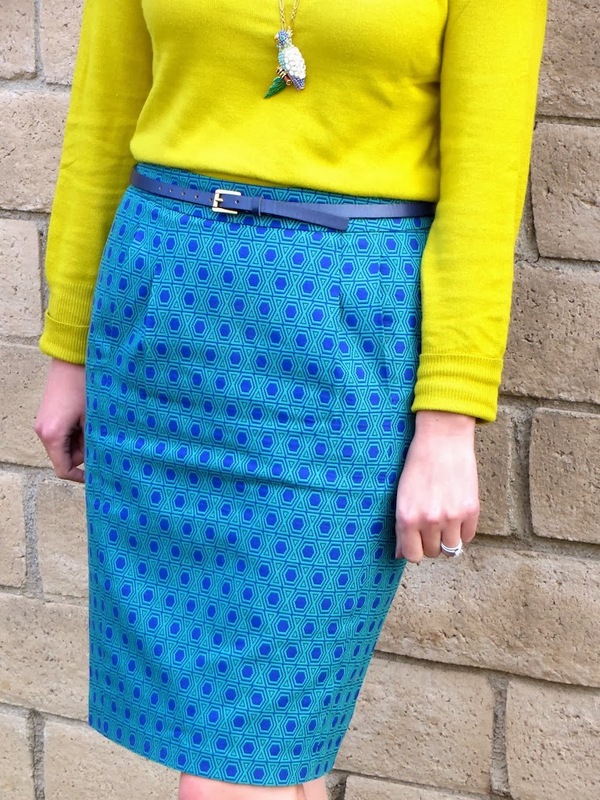 I feel like the outfit below really plays up the 70s feel of the pattern and color of the skirt. Plus, the garish parrot pendent also might be something that a foxy babe from the era might wear, but maybe that's a stretch! So I am pretty enamored with Fossil for not only charms now, but also as I recently discovered their clothing. Their sale prices are especially enticing when it hits the end of the season. What new brands have you discovered lately? You always look so good in brighter colors! Sounds like you are doing a great job abstaining from shopping for Lent Laura! 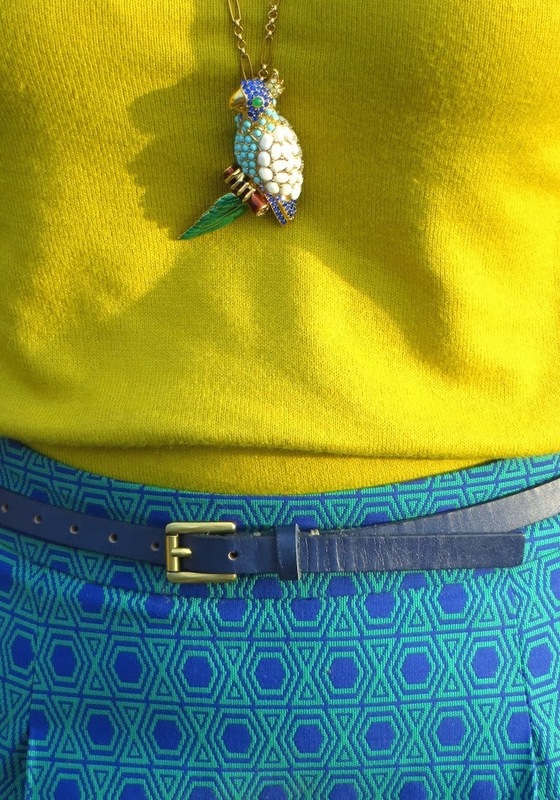 Ooh, I adore that skirt! I've never ordered anything clothing-wise from Fossil before - how did you find the sizing? I find the sizing of Fossil, at least based on the one item I own, TTS. J. Crew always runs big in my opinion, whereas this seems more true to my normal size.